This recipe calls for beef, but you can use pork, chicken or some game meats if you prefer. You can also leave meat out altogether. 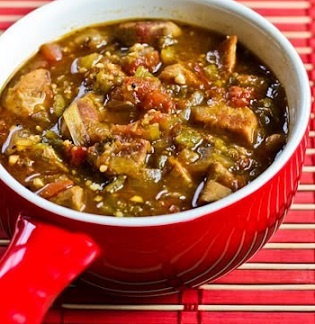 The restaurant guests and I love the addition of green chilies to this stew with its flavorful veggies and sauce. Stew is a basic dish worldwide. This is the beef stew of parts of Mexico and New Mexico. The combination of meat, vegetables and seasonings offers not only good eating but a total meal in just one bowl. Preparation time: 30 minutes. Makes 8 generous portions. When meat is browned, add the beef stock to the meat and bring to a boil; then cover and reduce heat, then simmer until beef is tender. Ole'! You're ready for a great meal! Serve hot in a bowl or over rice or even pasta with corn bread or warm tortillas and a salad. 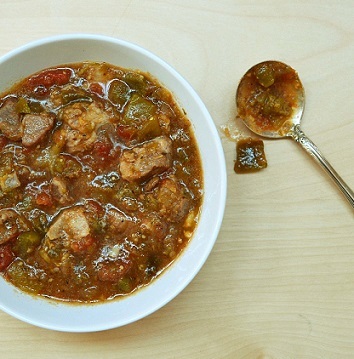 Enjoy your Green Chile Beef Stew and the company of those you share it with!